Your contract is with GB Motorhome Tours Ltd (Registered in England No.9542762) and the contract incorporates these Terms and Conditions. Upon making a booking or payment with us is implied acceptance of the Terms & Conditions. 1.1 By making a booking you confirm to be in receipt of the tour itinerary. Without this we are unable to accept your booking. When you make a booking and pay the deposit amount we will reserve your place on your chosen tour on the basis of the information supplied by you and these Terms & Conditions. Your booking will be taken as confirmed in respect of all persons named on your booking and a binding contract between us will come into existence upon your receipt of our confirmation. 1.2 Please check your confirmation and all other documents we send to you and please contact us within 7 days if any information appears to be incorrect or incomplete as it may not be possible to make changes after this time without incurring additional costs. We cannot accept responsibility of inaccuracies if we are not notified within 7 days. 1.3 Our contract is with the ‘Lead Name’ given at the time of booking and we can only accept the booking if this person is at least 18 years old. The Lead Name is responsible for ensuring other members of the party are aware of these Terms and Conditions and that they consent to him/her acting on their behalf in dealings with us. 1.4 Monies paid by you for your tour are all fully secured in accordance with the 1992 Package Tours Regulations. In providing this protection, until the fulfilment of your tour your money is held untouched in a trust account with HSBC in the UK; giving you peace of mind from start to finish your money is safe. 2.1 We reserve the right to change prices from those shown in the itinerary. If this occurs we will inform you of the change prior to your booking being confirmed. Once confirmed, except in the case of a clear error, any price changes may only be made in accordance with these Terms and Conditions. 2.2 Upon making your booking, confirmation will be issued after our receipt of your deposit. The balance of the total holiday cost is payable 8 weeks before the tour start date. Bookings may be cancelled and deposits retained should this not be received. If your booking is made within 8 weeks of the tour start date confirmation will be issued after our receipt of the full cost. 2.3 Motorhomes over 8m in length or total length of unit exceeds 8m with trailer, bile racks etc a surcharge may apply. Please advise us at time of booking if your unit exceeds 8m. 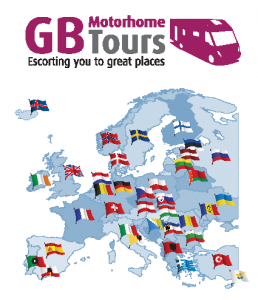 2.4 All fluctuations in exchange rates whilst the commercial British Pound to Euro rate is at or above £1.00 = €1.20 are guaranteed to be absorbed by GB Motorhome Tours. Where, on the date tour balances are due, the commercial exchange rate is below £1.00 = €1.20 GB Motorhome Tours will try to absorb this but maintains the right to apply a percentage exchange rate surcharge to your tour price up to the same percentage as the rate is below £1.00 = €1.20 on that day. 2.5 Once your booking has been confirmed the price of your travel arrangements is guaranteed except in the case of a possible exchange rate surcharge (see 2.4 above) or a change in UK government legislation, or of a clear error, or change to travel arrangements made by yourself where additional costs are incurred. 4.1 We expect to be able to provide you with the itinerary as stated and all of ‘what’s included’ of your holiday itinerary. However on occasions changes do have to be made, for example due to adverse weather conditions, road conditions, ferry schedules/routes changing, campsites being full/closing, places of interest being renovated etc. We therefore reserve the right to make these types of changes including the day by day order in which the itinerary runs. If this occurs before the tour departure date and we consider one or a collection of changes to have a major impact on the tour we will advise you as soon as possible and offer you the choice of accepting the change(s) or cancelling your booking with a full refund of monies paid. A major change would include a change of tour start time by more than 36 hours or a significant change of destination. 4.2 In the unlikely event we need to cancel your travel arrangements we will tell you as soon as possible. However, we will not cancel your travel arrangements less than 14 days before departure unless due to circumstances beyond our control, the consequences of which could not have been avoided even with all due care. These include, but not limited to, unavoidable technical problems with transport, severe changes imposed by rescheduling or cancellation of ferries by the relevant operator, tour directors being unavailable, war or threat of war, civil strife, industrial disputes, natural disaster, bad weather, terrorist activity. In these circumstances we will provide a full refund of all monies paid or if possible the opportunity to switch to another tour upon the payment /refund of any price difference. 4.3 Our tours require a minimum number of bookings to run. This number is kept low to minimise the potential of being a problem and in reality our tours have never failed to attract minimum numbers, and have always run. However, if there were insufficient demand we may have to cancel the tour. If we had to do this we promise to tell you no later than 6 weeks prior to departure and provide a full refund of all monies paid or if possible the opportunity to switch to another tour subject to the payment /refund of any price difference. 4.4 In the event of us cancelling your booking our liability is limited to the value of monies paid directly to us. No additional amounts can be included for activities you have made independently, for example the cost of connected travel arrangements or purchase of event tickets etc. 4.5 Whilst we are happy to advise who we anticipate the Tour Directors to be for a particular tour this can not be guaranteed and could be subject to change. A change in Tour Directors is not a major change unless specifically agreed with you at the time of your booking. 5.1 If you want to change your booking in any way please inform us as soon as possible; we will always try to help. Any changes apply to all members of your party for which the lead person accepts responsibility and may incur an extra charge or administration fee. You will be advised of any charge before we proceed. 5.3 If you wish to leave the tour early you may do so, at this point our contractual obligation to you will end. 6.1 If the contract we have with you is not fully completed by us we will offer compensation on a pro rata daily basis for the days uncompleted based on the cost of your holiday less the retail value of any ferry tickets provided by us. If a part of the contract is improperly performed by us or our suppliers we will offer you appropriate compensation limited to that item. We are not liable however where any failure in the completion/performance of the contract is due to a fault of yourself or some other member of your party; a third party unconnected with the provision of the travel arrangements where the failure is due to unforeseeable, unavoidable or unusual circumstances beyond our control, the consequences of which could not have been avoided even if all due care had been exercised. 6.2 For ferry crossings our liability is in accordance with the provisions of the 1974 Athens Convention on carriage by sea. 6.3 When we are liable to offer compensation this is limited to the cost of your holiday. However this limitation does not apply where the failure in performance has resulted in death or personal injury. The Company’s liability ends on the date and at the place stated in the itinerary. 6.4 Excursions, events, travel arrangements and other tours you may choose to book whilst away do not form part of the tour provided by us. In such cases your contract and related responsibilities for these is with the operator/provider you book with rather than with us. 6.5 Activities you participate in either with or without our Tour Directors during the tour that are not specifically listed in the tour itinerary as ‘included’ or ‘optional’ are done as a group of friends for which GB Motorhome Tours is not liable. 7.1 It is your responsibility to keep up with the tour itinerary and for being at the evening destination in time to check in. If through choice or otherwise you are unable to make the destination in time please advise the Tour Directors. Costs incurred by your delay will be your responsibility. 7.2 For group meals and excursions it is your responsibility to be in the right location on time. If through choice or otherwise you are unable to comply with this the event will continue without your participation. 7.3 If you have a special request, for example dietary requirements, mobility etc we will do our best to help. Reduced mobility may make some tour events not possible to you, unfortunately in these circumstances we are unable to offer reductions as tour events are pre-booked for all in advance. Special requests will always be passed onto suppliers but we cannot guarantee they can accommodate all or any of these, and we are not liable in this respect. If your special request is vital to your travel arrangements this must be specifically agreed with us in writing before you book. 7.3 Your vehicle must be kept legal for travel in the countries being visited and it is your responsibility to ensure you have in place the necessary arrangements for this including travel on any toll roads being used. 8.1 Please ensure you and all persons included in your booking meet all passport, visa and health certificate requirements for travel in the countries included in the tour. A valid passport is required for all tours, where additional visa’s are required for specific countries this will be advised at the time of booking. Vehicle drivers must carry all necessary documents (V5, insurance, MOT if applicable and Green Card if applicable) for driving in the countries included on the tour and ensure their vehicle complies with all local laws. This is particularly important as we are unable to accept responsibility or liability for refusal of entry or travel in countries and this could result in you incurring expenses and/or being delayed. 8.2 If you intend to include a domestic pet in your travel arrangements please advise us before or at the time of booking. It is your responsibility to ensure that your pet has the necessary health checks and documentation required in the countries which you are visiting and that you comply with UK re-entry regulations. Please note that some campsites may impose additional charges for pets which will need to be paid locally by you and some may have pet restrictions. Pets may only be carried if responsible arrangements have been made for them whilst you attend group excursions/meals. 9.1 You must take out travel insurance suitable for your needs before you travel. This should include cover for any events that have been or will be organised and arranged independently of the tour itinerary. It should also cover you for cancelling your booking pre-departure as monies paid to us are subject to the charges laid out in these terms & conditions. One such provider is ‘Insure and Go’ who can be found at www.Insureandgo.com, Tel. 0333 255 3119. We cannot accept responsibility for any costs incurred as a result of failing to have adequate insurance. 9.2 It is strongly advised you have vehicle breakdown cover for the countries being visited. In the event of breakdown we and our Tour Directors will do all we can to help but we cannot offer any refunds for your delay or compensation for missed campsite nights, excursions, meals etc. 10.1 You are responsible for the behaviour of yourself and your party. We can refuse to accept you as a customer or refuse to continue dealing with you and/or any members of your party by terminating your travel arrangements if behaviour is or is likely to be, in our reasonable opinion, or in the reasonable opinion of our Tour Director, or any other person in authority, disruptive, upsetting or dangerous to yourself or anyone else or if you or any member of your party have caused or are likely to cause damage to property. If you are asked to leave a tour we will not pay any refunds or compensate you for additional costs you may incur as a consequence. 11.1 If you have cause for complaint while travelling please bring it to the attention of our Tour Director. The sooner you do this the better as many complaints can be rectified by the Tour Director once they are aware of them. If you do not wish to raise the matter with the Tour Director you can refer it to us directly by email or phone. Should your complaint not be resolved please follow this up in writing within 7 days of the tour end date. 11.2 Our obligation and that of our suppliers is to provide the items included in your tour and in doings so take reasonable skill and care in the provision of these. Any complaints must show reasonable skill and care has not been taken. 12.1 Information about you and your party, including names, contact details, special needs etc is collected by us when you make a booking. We disclose part of this information to our suppliers, who may be located outside the UK and EU, for the purpose of providing you with your holiday. Only information necessary for this purpose is disclosed. Some information, for example relating to your health, may be ‘sensitive personal data’ within the meaning of the Data Protection Act 1998. If we need this to be able to cater for your needs it is collected on condition that we have your positive consent. If you do not agree to our use of the information we cannot accept your booking. GB Motorhome Tours is registered with the Information Commissioner’s Office for complying with Data Protection regulations our reference is ZA131304. 13.1 The Company and you both agree that any dispute, claim or any other matter of any description, whether involving personal injury or not, arising out of or in connection with your booking or travel must be dealt with under the Travel Industry Arbitration Scheme or brought only in the courts of England and Wales (unless you are a resident of Scotland or Northern Ireland in which case any proceedings may be brought in either the courts of your own country or those of England and Wales). We both agree that English law and no other will apply to the contract between us (unless proceedings are brought in Scotland or Northern Ireland, in which case Scottish or Northern Irish law will apply). If this provision is not acceptable to you unfortunately we cannot accept your booking. 14.1 Ferry crossing arranged by us may be subject to the Athens Convention of 1974 relating to the carrying of passengers and their luggage. You agree that the transport company’s own Conditions of Carriage will apply to you on that journey. When arranging this transportation for you, we rely on the terms and conditions contained within the Convention and the ‘Conditions of Carriage’. In making your booking you acknowledge that all of these terms and conditions form part of your contract with us as well as with the transport company. 15.1 Campsites and camping locations used throughout tours are selected on a basis of providing an appropriate place for staying in a motorhome to enable the venues in the tour itinerary to be visited. Whilst quality campsites are the preferred option of places to stay; on some occasions (particularly on longer and more adventurous tours) camping options can be very limited and campsite standards very variable. On many continental campsites there is no ’20 foot rule’ like on UK campsites. 16.1 It is possible on some occasions photographs are taken of a tour and later used by us for promotional purposes. If you would prefer yourself, any member of your party or your vehicle not to appear in such photographs please advise us at the time of booking.